While RIM is putting the final touches on its new WebKit based browser, the popular third party Bolt Browser for BlackBerry has received an upgrade to version 2.1. The new build now offers tabbed browsing so that 'Berry owners can enjoy viewing multiple sites. Version 2.1 adds HTML5 video support which adds more Flash oriented video web sites that will work with the Bolt Browser. 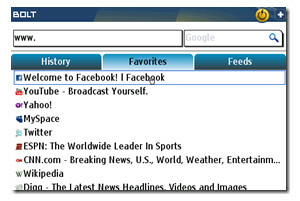 Facebook fans using BlackBerry will be happy to know that Bolt has improved its integration with the page. 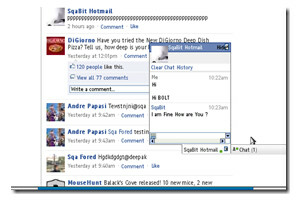 Facebook chat can now be used in the browser as well as giving users the ability to copy text and post it on the social networking site. The browser's widget gallery has been upgraded and Bolt's servers can now handle WebKit 4.03. Current Bolt users should receive a prompt to get upgraded while new users can go to this link to download the latest version of the Bolt Browser. And before you know it, RIM will be dropping its new WebKit broswer on your 'Berry, bringing your native surfing capabilities up to 21st century standards.